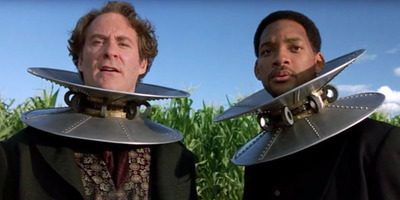 Warner Bros via YouTube‘Wild Wild West’ was one of the biggest flops in Will Smith’s career. Will Smith may be one of the biggest actors of all time, but even he doesn’t have a perfect record. And nearly two decades later, Smith still sees “Wild Wild West” as a low point. The actor said it came during a time when he was trying to be the biggest movie star in the world. “I had so much success that I started to taste global blood and my focus shifted from my artistry to winning. I wanted to win and be the biggest movie star, and what happened was there was a lag — around ‘Wild Wild West’ time — I found myself promoting something because I wanted to win versus promoting something because I believed in it,” Smith said at a Cannes Lions panel. And while Smith would continue to do crowd-pleasers like “Hitch” and blockbusters like “I Am Legend” long after “Wild Wild West,” you can definitely notice some different choices. Over the past decade, he’s pursued passion projects like “Ali,” “The Pursuit of Happyness,” and “Concussion.” The first two earned him Oscar nominations. However, Smith isn’t done trying to be a movie star. He’ll be in this summer’s highly anticipated “Suicide Squad,” which is out on August 5.